These reflections were inspired by the two-day conference “1914-1918 The Making of the Modern World” held at the Toronto Munk School of Global Affairs on July 30 and 31, 2014. Speakers presented papers on a wide variety of topics, both national and international, on military, political, social and artistic themes associated with the Great War and its legacy. The conference concluded with a visit to the residence of the Lieutenant Governor, David Onley, at Queens Park and later that evening with an emotional evening of military formations, music and speakers at Varsity Arena packed with 6000 people. I will not attempt to address all topics and speakers but will focus on one thread, albeit never explicitly stated: the frequent disconnect between how veterans and civilians experienced and recalled the war and the contemporary and later attempts to depict it in art and popular culture. Apart from commemorations, my impression is that most public awareness about the Great War is derived from films – All Quiet on the Western Front, Paths of Glory, Gallipoli to name just a few – or from novels such as Pat Barker’s Regeneration trilogy and Sebastian Faulks’ Birdsong. What they all have in common is their anti-war message, that this war, as opposed to the Second World War, was not only a tragedy but a waste. Even Margaret Macmillan in her masterfully-delivered keynote overview on the origins and legacy of the war used the word “waste” to signify the human losses and the problems that it created: among them, that without the war, Russia would have evolved into a constitutional monarchy and the Bolsheviks would have never come to power; without Germany’s defeat, Hitler and Nazism may not have occurred, and no Second World War. And the problems in the Middle East that continue to bedevil us are in part a legacy of the war. Another take on the war delivered by historian, Jonathan Vance, drew upon his seminal monograph, Death so Noble: Memory, Meaning and the First World War (UBC Press, 1997) to profile John Daniel Logan, and then to extrapolate from his life the values that not only shaped him but those of his English-Canadian fellow veterans and civilians alike between the world wars. Prior to the Great War, Logan acquired a superior education, wrote poetry and literary criticism, taught and worked in advertising. None of these accomplishments provided him with financial or emotional satisfaction. It was only when he joined the army in 1916 at the age of 46 and fought at Vimy and Passchendaele that he found his métier in life. He enjoyed not only the comradeship of his unit but he drew spiritual sustenance from the ultimate sacrifices made for the cause. After the war, Logan assembled two collections of poetry that were inspired by the vision of a heroic death that was sublime and beautiful, expressed in the lofty language that we usually associate with British writers such as Rupert Brooke before his death or J.M. Barrie before his disillusionment. But Logan never lost his belief in the spiritual dimension of a sacrifice willingly made, regardless of the brutality inflicted upon the body by shrapnel, artillery or gas. War was the supreme adventure, a great glorious undertaking demonstrating that life was less important than death. He never changed his mind about that; the poems he wrote before 1916 were similar to those he wrote after. And yet before we stereotype him as pre-war Victorian, Vance reminded us that Logan was dismissive of the jingoistic war poetry and promoted the aspirations of women poets. He likely would not have appreciated D.W. Griffith’s heavy-handed propaganda war film, Hearts of the World, of which we were shown a clip by another speaker, the film scholar, Seth Feldman, who provided an excellent overview of contemporary and more recent films about the war. But Logan did believe that the “trial of war” would invigorate Canadian culture. Logan’s belief in noble sacrifices for a righteous cause, not the waste of human lives, reflected the sentiment of much of the English-speaking population during and after the war (unlike French Canadians who could only remember the war with bitterness and its associations with the rancorous 1917 conscription crisis). Theirs (the English) was a just war against an evil tyranny and they hearkened back to medieval and Victorian texts and imagery to commemorate it through war memorials, stained glass windows in churches that deified as Christ-like soldiers and Armistice Day proceedings. 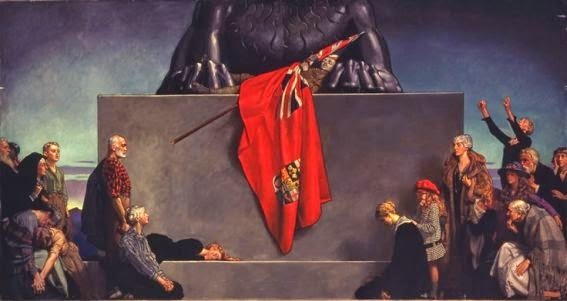 In her PowerPoint of war paintings, art historian Maria Tippet featured a popular painting, The Flag by John Byam Shaw that represents the sacrifice made by the Canadian soldier depicting the body draped with the Canadian red ensign placed between the paws of the British lion and surrounded by people for whom the sacrifice had been made. The peace and serenity that suffuses the dead soldier is how Canadians wanted to remember those who willingly sacrificed their lives. By contrast, F.H. Varley’s For What? is a controversial, modernist painting in which dead soldiers are heaped unceremoniously in a cart to await burial beneath a row of crosses. 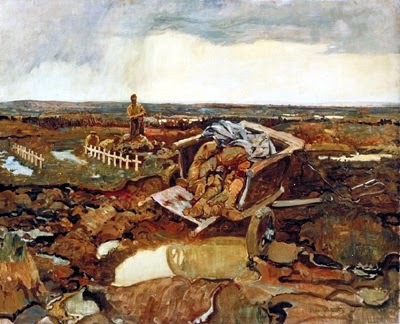 The image, like the title, conveys the pointlessness of the war, a perspective vehemently rejected by most English-Canadian veterans and civilians because, as Vance quoted a politician, it would mean surrendering to desolation. 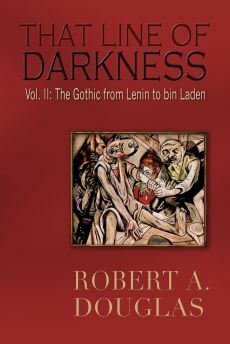 One can only imagine what veterans and the public would have thought of the savagely satirical drawings and paintings of the German Expressionist artist, George Grosz, or his national compatriot, Otto Dix, who spent four years in the trenches and rendered his experience into unflinching, stark etchings and paintings. Unlike in Britain where the post-war era was marinated in disillusionment, Canadians, according to Vance, surrendered to a myth that was “a complex mixture of fact, wishful thinking, half-truth, and outright invention.” The myth bore little resemblance to the slaughter that occurred but enabled veterans and the public to make sense of it. Rather than recount the horrors of war—for the most part veterans remained adamantly silent—they remembered only the good times: the lighter, more humorous moments, a beautiful sunrise, bathing in streams and the laughter of the “boys.” These selective memories were recalled in memoirs, novels, poetry and film such as the melodrama Under the Black Eagle that follows the adventures of a police dog on the Western Front. The anti-war vision found expression in novels such All Quiet on the Western Front by Erich Maria Remarque. Its cinematic adaption was seen in Canadian theatres but in no way enjoyed the support it garnered elsewhere. The Canadian veteran, Will Bird, wrote his memoir, And We Go On, as a corrective to books such as All Quiet that he believed were “putrid with so-called realism.” Unlike other Canadian accounts that underscore the lighter more humorous moments, Bird’s account does not ignore the physical horror but in his telling he and his comrades retain their sense of decency and humanity, and were not brutalized by their war experience. Bird’s memoir was well-received and, despite its bracing grimness about life in the trenches, was more commensurate with the upbeat convictions of Logan and the romantic pre-war English-Canadian sensibilities during the interwar years. 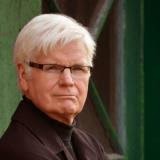 Mark Humphries paper on “Shell Shock and its Aftermath” reinforced conservative attitudes by linking them to the culture’s definition of masculinity when Canadian shell shock victims applied for a pension after the war. More than 15,000 Canadian soldiers were diagnosed with some form of war-related psychological wounds. Humphries provided the example of Hunter L. who displayed heroic service in France before being blown up by a shell and rendered unconscious after which he “cried for some time.” He returned to duty voluntarily and incurred a similar experience, was shipped to a hospital in England where he was “on bad terms” with the other patients for being emotional. He was sent home, continued his education becoming a professor. In 1932 he broke down, the shell shock symptoms returned and he was unable to work. He applied to the federal government for a pension arguing that the war was responsible for his breakdown. The two doctors who reviewed his case refused to grant him a pension labelling him a deviant predisposed to psychological illness attributing it to “early overprotection, lack of boyish animal spirits, rebelliousness to authority and…the physical stigmata of deviation,” that is, physical signs on his body and certain aberrant mannerisms suggesting he was more feminine than masculine. Although he highlighted only Hunter L. in his talk, Humphries concluded from his study of other similar cases that men who sought treatment or asked for compensation were violating the unwritten code of conduct: men were to be self-reliant, aggressive and unemotional. Otherwise, they were tainted with being neurotic and feminine. When their manhood was at stake, no wonder traumatized veterans were forced to suffer in silence. At this point we can come full circle to where this paper began—with recent novelistic and film treatments of the war. Today there is a greater understanding of masculinity, as a social construct, and that current attitudes toward manhood have substantially changed since the period under review, and about post-traumatic stress, which is recognized as a product of the realities of wartime conditions. Rarely does one hear today that this condition is the result of a psychological predisposition even though it is still ingrained in the military culture that one should not ask for help. In Regeneration, the first novel in Pat Barker’s trilogy (renamed Behind the Lines in the DVD version), she presents two historical physicians: Lewis Yealland, a Canadian neurologist with a reputation for 'curing' shell-shocked patients and ensuring their quick return to the trenches, who employed electric-shock, shouted commands, prescribed isolation and a restricted diet to treat hysteria, and William Rivers, an English anthropologist, who believed that war neuroses did not result from the war experiences themselves, but were "due to the attempt to banish distressing memories from the mind.” He encouraged his patients to remember, instead of trying to forget what they had been through. 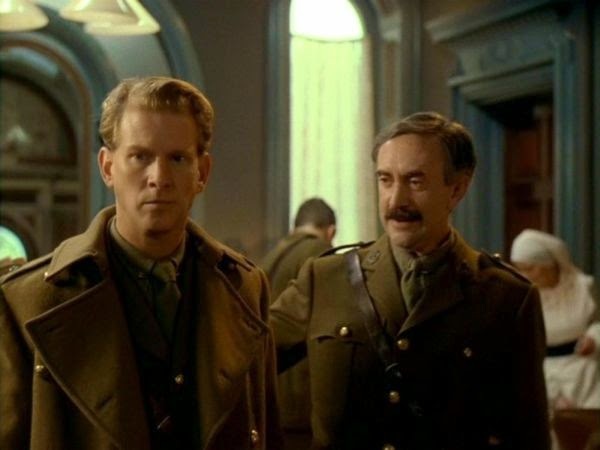 (Barker’s sympathetic treatment of River’s therapeutic relationship with the poet Siegfried Sassoon was generally unrepresentative of the times.) Yealland was a product of his culture, whereas, Rivers seems historically out of place and would have been much more comfortable in the present. Canadian veterans, civilians and doctors would have dismissed Rivers as naïve at best and possibly dangerous and would have admired the achievements of Yealland, the reverse of how I suspect we would currently regard them. Today the public will continue to read novels and see films that possibly project the attitudes of our time back into an earlier era—the past as a foreign country may be a cliché but it is true—but readers can also benefit from good history that, without condescension and with a sensitivity to complexity, reconstructs the values and the political and cultural expressions of those who lived in earlier times. For me the need for historical works to supplement popular culture was the greatest insight I received from this thoughtful and rich conference. I believe that the conference organizers at the Munk Centre will soon make available a video podcast as they have done with so many of their previous symposiums. Do yourself a favour and watch it. 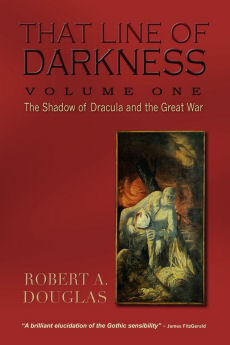 – Bob Douglas has written extensively on the Great War in That Line of Darkness: The Shadow of Dracula and the Great War (Encompass Editions, 2012). 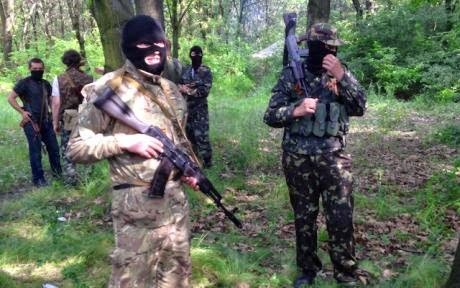 This is the concluding post (for the time being) on Russia and the Ukrainian crisis. Apart from ethic Russians, and countries like China, Brazil and India, who dwell in a media bubble that substitutes fantasy for reality, the preponderant circumstantial evidence points to the conclusion that pro-Russian separatists fired a surface-to-air missile at a commercial aircraft from Ukrainian territory at what they probably thought was a Ukrainian military aircraft. Separatist leaders boasted about it on social media and lamented their error in messages intercepted by Ukrainian intelligence and authenticated by America. It is also indisputable that Russia armed the rebels with tanks, personnel carriers, artillery—and batteries of surface-to-air missiles. Putin's response to the tragedy was to stonewall and deny responsibility while escalating his weapon delivery to the insurgents. How should the West respond to this most aggressive expression that “denounces and distances itself from liberal democracy" known as Putinism? When Russia undertook its Anschluss of Crimea after a hastily arranged plebiscite amid the presence of 20,000 Russian soldiers, Putin gambled that the West might noisily protest and might impose some minor sanctions but that he would face no serious difficulties. His own domestic popularity soared to over 80 percent. Long forgotten was the opposition to the 2011 Parliamentary elections and his position to run again as President. Besides economic considerations that will be discussed below, as Fareed Zakaria notes, Putin articulated an ideology based on nationalism, religion, social conservatism and control over the media—the antithesis of the Western values of individual rights, free expression, tolerance, cosmopolitanism and internationalism. Putin has provided a model for leaders such as Prime Minister Viktor Orban of Hungary who has made clear his disdain for liberal democracy and his embrace of an “illiberal new state based on national foundations” Long an admirer of Putin, Orban since his Fidesz Party won election in 2010, his government has taken steps to undermine the rule of law, gut press freedom, attack civil society groups and increase executive power.